It's Friday night and the weekend has began. But I cut short my social drinking session with friends, declined dinner invites and came home early tonight. Did I hear you gasp at that news? No, I'm not sick or a hermit (although some may say otherwise) but I have very good reasons for taking such drastic actions tonight, dear readers. For tomorrow will be the highly anticipated Melbourne Beauty Bloggers Event (MBBE), the biggest beauty blogger event in Melbourne's calendar! Now if you've been reading my blog for a while you will know I'm one of the lucky gals to be part of an amazing community of beautiful, gorgeous and talented beauty blogging ladies who have become my great friends (and no longer just fellow bloggers). Together, we are the face of MBBE. The group feels like a sorority really, and I love our sisterhood and support we give each other. Of course, being a part of such a beautiful and gorgeous bunch, there is a tiny bit of peer pressure, I need to do my part to primp and prime and look my very best and not let my ladies down in representing MBBE. So I came home to paint my nails, shave those fuzzy legs, tame those stray brows into shape and put on a brightening, firming face mask to ensure I don't look like I've been hit by a truck because there is no way I want those dark circles under my eyes after a long week of work and constant lack of sleep to mar the photography galore that will go on tomorrow. So what do I turn to for such an important task? 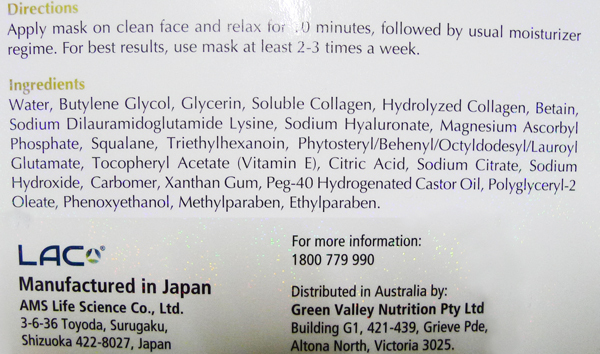 Well, this would be none other than a miracle worker- a super-charged sheet mask! This sheet mask is infused with hydrolysed collagen, vitamin C, hyaluronic acid, vitamin E, and squalane to supercharge the skin and hydrate, tone and brighten. I used this straight after taking a shower as it's a non-rinse off mask and I want every drop of the serum to absorb into skin for full benefits (I even rub any excess serum from the packet all over my arms to make sure they get some TLC as well). It gives an immediate soothing and cooling sensation which I love and is totally relaxing to use. Results? well 20 minutes later and after using the mask, my face is slightly sticky after the serum has dried and absorbed into my skin is soft, more radiant in skintone and has a luminosity that looks lit from within. I could get away with not using any moisturiser afterwards because it was so hydrating. Next day, I definitely notice the skin-plumping factor kicking in and I still have that lit from within look - honestly even my dreaded dark circles seems lighter as well .Then there is a taut firm feeling as my skin is tightened and these results last for 2 days. 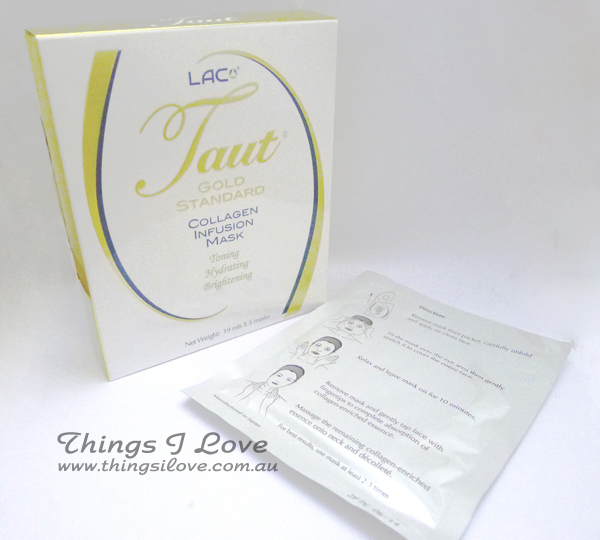 Lac's collagen infusion mask is definitely gold class in my books for giving such visible results. I'd use this the night before any big event or occasion where I want to look my best. Actually, scratch that - I want to use this every other night of the week so that I can look my best every single day. Now I just have to finalise what I'm going to wear tomorrow and I'm all set for the big day. 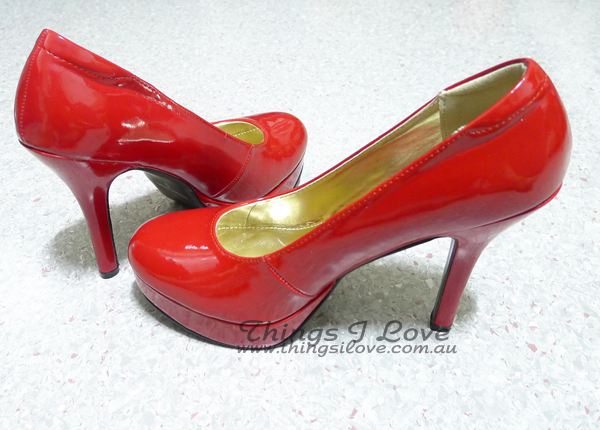 I've leave you with a picture of the pair of shoes I'll be wearing for big afternoon tomorrow. What do you like to do to get ready for big events? Taut Collagen Infusion Mask 19ml RRP A$44.95 for a pack of 5 sheet masks at all GNC stores or online. I didn't even know there was a MBBE! Do you know if they have them on the gold coast/brisbane? probably not. We're not as fabulous as Melbourne, that's for sure. Hi Emma, Yes, MBBE is over a year old and getting better every day! Thanks for sharing this with us and giving us all the information. Thanks for sharing us.